Chris DeMaria is a health and fitness writer and has written for various online publications. In addition to writing, he has also coached college football. DeMaria graduated with the highest honors from West Virginia University with a degree in exercise physiology. Fear can overcome any athlete. Some fear the game itself, but others fear the large crowds (enochlophobia) that often come to basketball games. Anxiety is often associated with these problems, as players worry about the game and possible failure. This can be a problem for basketball players at any level. 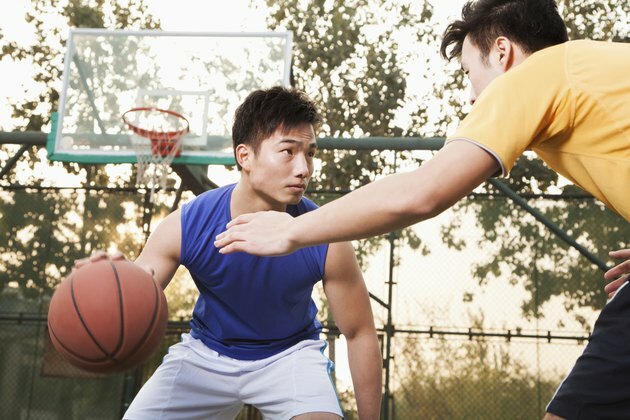 As an athlete moves up in levels of play, the pressure may increase fear and anxiety. Imagine the crowd is not there by creating in your mind an image that you are in a small gymnasium without a crowd. There is only you, your teammates and the opponents. Take a deep breath. Deep breathing is a way to slow your heart rate. This will calm your nervous system. Focus your attention on the game. The human mind is only able to concentrate on one thing at a time. By focusing on the game you can eliminate your thoughts about fear of crowds. Take a step back and do more deep breathing when you are in a high-pressure situation such as shooting free throws. Take the extra second to gather yourself and calm yourself down. Practice these steps repetitively. Fear and anxiety are not easy to overcome, so practicing these steps willl help you subdue your fear. Ask yourself a series of questions about the source of your anxiety. What are you afraid of? Is it harmful? By answering those questions you will be able to attack your fear. Step out onto the court. Once you are on the court, perform relaxation exercises. Look at your teammates and competitors. Notice that they are enjoying the game and that it is safe and fun. You also may notice that you are not the only one who has fear or anxiety. It can be comforting to know you are not alone. Talk with someone, preferably a coach, who can provide additional support to help you combat your fears. Talking to a teammate with the same or a similar problem may be comforting as well. If you continue to have problems with fear and anxiety, consult a trained professional to talk about other options to combat this. Talking with a teammate may be beneficial but be careful who you confide with. Some teammates will gossip about your fear and make fun of you in front of others.